One of the missions of Pontoon since its inception has been to host critical information needed for localization under one roof. Over the course of the last few months several pieces of that puzzle have been solved. Until recently, a vital piece of information was missing from Pontoon dashboards, namely translation errors and warnings. Localizers had to go hunt them on the standalone product dashboard, where they appeared 20-30 minutes after being submitted in Pontoon. If they wanted to fix an error, they had to go back to Pontoon, submit a (hopefully) legit translation, and wait another 20-30 minutes to see product dashboard go green. As you can imagine, very few localizers actually did that. So in practice it was mostly project managers that were looking for errors, submitting suggestions with fixes and pinging localizers to approve them. The first step towards bringing errors and warnings closer to localizers’ attention was made back in May when we started using compare-locales checks in Pontoon. These checks are split into two groups. The first consists of checks that need to be passed by translations landing in localized products (e.g. Firefox builds). Pontoon prevents translations failing those checks from even being saved. The second group contains more loose checks, which aren’t required in the build process and can be bypassed in Pontoon. Since May we extended compare-locales support from the basic translation workbench to all places where translations can enter Pontoon, including batch actions, file upload, and import from VCS. Finally, we performed checks on all translations previously stored in Pontoon. Now that we had the data about failing checks, we started integrating them into the localizers’ workflow, so they could be fixed easily. We introduced two new translation statuses: Errors for translations failing checks from the stricter group, and Warnings for translations failing checks that can be bypassed. Next, we started calculating Errors & Warnings counts and revealing them on dashboards. Shortly after corresponding filters have been implemented for quick access to strings with failing checks. Errors (red) and warnings (orange) are designated with their respective colors in the string list. The list of failing checks appears in the editor upon openning the string. Finally, the effort spanning multiple quarters started paying off. In the 7 days since the (silent) launch, the number of errors across all localizations went down by 42%. The number of warnings (which include false positives) decreased by 10%. A huge shout-out to jotes, the powerhouse behind landing translation errors and warnings in Pontoon! As part of this effort he not only fixed 8 bugs with a total of 3,000 lines worth of changesets, but also designed the development process we used. Another important piece of information that made it to Pontoon recently are localizations that don’t take place in Pontoon. We introduced the ability to enable such localizations in read-only mode, so project managers can now access full project stats in dashboards and the API. Additionally, all Mozilla translations are now accessible in the Locales tab, and Translation Memory of teams that localize some of their projects outside Pontoon now also includes those. Inversely, we removed system projects (Tutorial and Pontoon Intro) from dashboards, which means they now contain not only all, but also only the relevant stats. The most critical piece of information coming from the tags feature is resource priority. It used to be pretty hard to discover, because it was only available in the Tags tab, rarely used by localizers. Back in July we fixed that by exposing resource priority in the Resources tab of the Localization dashboard. Similarly we also added a resource deadline column. As a consequnce of these two changes localizers can now see resource priorities and deadlines without leaving Pontoon for the standalone web dashboard. We hope these changes will increase efficiency of the Mozilla localization community and we’re happy to see numbers already started confirming that. Which is a great motivation for the road ahead of us. There are plenty of improvements we’d still like to make to our dashboards, ranging from smaller ones like adding word count to stats to bigger efforts like tracking community activity over time. You’re welcome to submit your own idea or start hacking on one of the good first bugs. Please note some of the information provided in this report may be subject to change as we are sometimes sharing information about projects that are still in early stages and are not final yet. Are you a locale leader and want us to include new members in our upcoming reports? Contact us! Javanese and Sundanese locales have been added to Firefox Rocket and are now launching in Indonesia. Congrats to these new teams and to their new localizers! Come check out the Friends of the Lion section below for more information on who they are. There are currently few strings landing in Nightly, making it a good time to catch up (if your localization is behind), or test your work. Focus in particular on certificate errors and preferences, given the amount of changes happening around Content blocking, Privacy and Security. The deadline to ship any localization update in Beta (Firefox 63) is October 9. It’s been a while since we talked about Fluent, but that doesn’t mean that the migration is not progressing. Expect a lot of files moving to Fluent in the coming weeks, thanks to the collaboration with students from the Michigan University. Firefox Focus for Android is launching a new version this week, and it’s shipping with 9 new locales: Aymara (ay), Galician (gl), Huastec (hus), Marathi (mr), Punjabi (pa-IN), Náhuat Pipil (ppl), K’iche’ (quc), Sundanese (su), Yucatec Maya (yua). 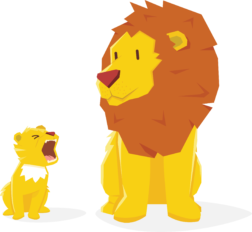 The Activate Mozilla campaign aims at the grassroots of volunteer contributions. The initiative wants to bring more clarity on what are the most important areas to contribute to at Mozilla right now by providing guidance to mobilizers on how to recruit contributors and create community around meaningful Mozilla projects. The project is added to Pontoon in a few required languages, with opt-in option for other languages. Once the completion reaches 95%, the locale will be enabled on production. There is no staging server, and any changes in Pontoon will be synced up and pushed to production directly. 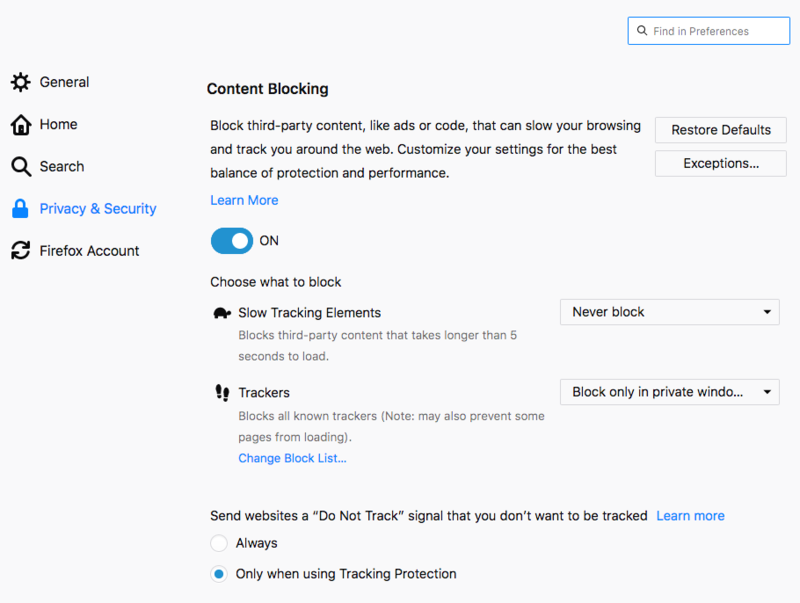 Mozilla.org has a new tracking protection tour that highlights the content blocking feature. The update is ready for localization, and the tour will be available on production in early October. The new home page was launched earlier this month. It is only available for 50% of the users during the A/B testing phase. The new look will roll out to all users in the next sprint. The purpose of this redesign is to convert more visitors to the site to contribute. We hope the new looking will help improve the conversion rate we currently have, which is between 10-15%. Though the change doesn’t increase more localization work at string level, the team believes it will bring more people to donating their voices to established locales. If your language is not available on the current site, the best way to make a request is through Pontoon by following these step-by-step instructions. To learn more about Common Voice project and discussions, check them out on Discourse. On the Advocacy side, the copyright campaign will continue after the unfortunate vote from the EU Parliament and the next steps are being discussed. The final vote is scheduled towards the end of year. The Support site is getting closer to launching its visual refresh, which will include a few new strings in Pontoon. Read more about the “Top 20 Articles” sprint for several locales here. Firefox Reality content has been added to the Knowledge Base, but there is no need to localize it for now. New homepage. The new homepage was designed and developed by Pramit Singhi as part of Google Summer of Code. Apart from the new design, it also brings several important content changes. 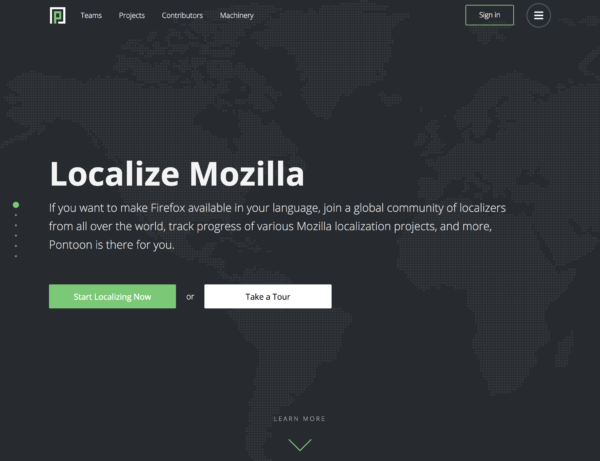 It presents Pontoon as the place to localize Mozilla projects, explains the “whys” and “hows” of localization at Mozilla in general, brings a clear call to action, and moves in-context localization demo to a separate page. Guided tour. Another product of Google Summer of Code is a guided tour of Pontoon, designed and developed by an experienced Pontoon contributor Vishal Sharma. It’s linked from the homepage as a secondary call to action, and consists of two pieces: the actual tour, which explains the translation user interface, and the tutorial project, which demonstrates more details through carefully chosen strings. System projects. 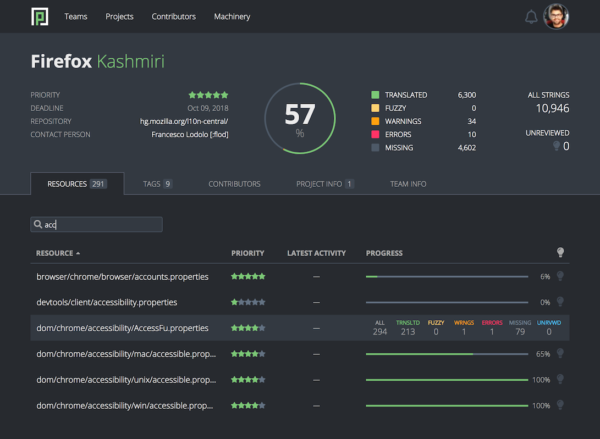 Vishal also developed the ability to mark projects as “system projects”, which are hidden from dashboards. The aforementioned Tutorial project and Pontoon Intro are both treated as system projects. Read-only locales. Last month we enabled locales previously not in Pontoon, in read-only mode. 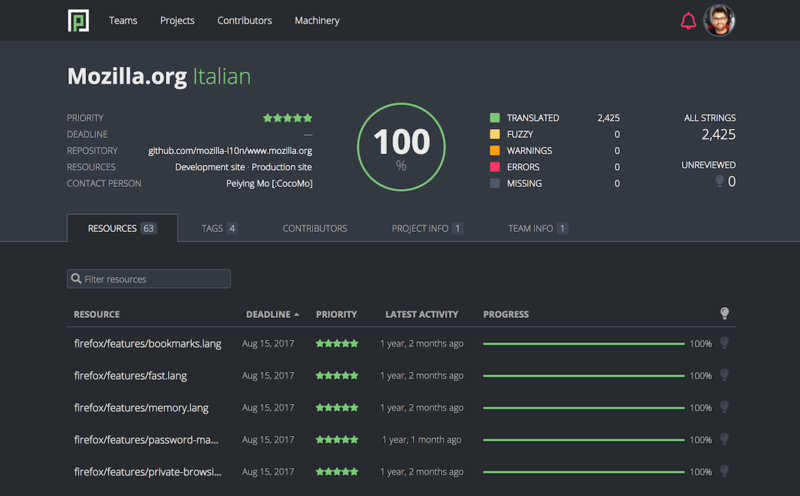 That means dashboards and the API now present full project status across all locales, all Mozilla translations are accessible in the Locales tab, and the Translation Memory of locales previously not available in Pontoon has improved. Check out the newsgroup for more details on which locales were enabled for which projects. Unchanged filter improvement. Thanks to Raivis Dejus, the Unchanged filter now works as expected. Previously, it returned all strings for which the source string is the same as one of the suggestions. Now, it only compares source strings with active translations (show in the string list). Here’s a quick Pontoon tip that a lot of people already know, but can still help some. This feature is meant to allow you to easily copy placeables into your translation by clicking them. This saves you time and reduces the risk of introducing typos if you manually rewrite them, or partially select them while copy/pasting them. One common misconception is to think those elements should always be kept in English. While it’s certainly true in multiple cases (variables, HTML tags like in the screenshot above…), there are several places where Pontoon highlights parts of a string that could or should be translated. Here Pontoon thinks those words are acronyms, and that you could potentially keep them in your translation. It turns out here they are not acronyms, it’s just a sentence in full caps, so we can simply ignore the highlights and translate it like any other string. To summarize the feature, Pontoon does its best to guess what parts of a string you are likely to keep in your translation, but these are suggestions only. Also remember, you’re not alone! If you have a doubt, you can always reach out to the l10n PM owning the project. They will clarify the context for you and help you better identify false positives. Jakarta (Indonesia) Rocket Sprint held on August 11-12 added two new languages to the product. Javanese contributor Akhlis summarized the weekend activity with his blog. Ali Demirtaş, who surpassed the goal of over 1 thousand suggestions for Turkish. Ahmad Nourallah, who localized numerous Support articles as part of the “Top 20” month. Know someone in your l10n community who’s been doing a great job and should appear here? Contact on of the l10n-drivers and we’ll make sure they get a shout-out (see list at the bottom)! Facebook group: it’s new! Come check it out! #l10n irc channel: this wiki page will help you get set up with IRC. For L10n, we use the #l10n channel for all general discussion. You can also find a list of IRC channels in other languages here. Did you enjoy reading this report? Let us know how we can improve by reaching out to any one of the l10n-drivers listed above. After a quick pause in July, your primary source of localization information at Mozilla is back! As localization drivers, we’re currently working on rethinking and improving the experience of multilingual users in Firefox. While this is a project that will span through several releases of Firefox, the first part of this work already landed in Nightly (Firefox 63): it’s a language switcher in Preferences, hidden behind the intl.multilingual.enabled preference, that currently allows to switch to another language already installed on the system (via language packs). The next step will be to allow installing a language pack directly from Preferences (for the release version), and install dictionaries when user chooses to add a new language. For that reason, we’re creating a list of dictionaries for each locale. For more details, and discover how you can help, read this thread on dev-l10n. We’re also working on building a list of native language names to use in the language switcher; once again, check dev-l10n for more info. Pages for certificate errors have a new look. To test them, you currently need to change the setting browser.security.newcerterrorpage.enabled to true in about:config. The testing instructions available in our documentation remain valid. There’s a whole new section dedicated to Content blocking in preferences, enabled by default in Nightly. It’s summer time in the western hemisphere, which means many projects (and people!) are taking a break – which also means not many strings are expected to land in mobile land during this period. One notable thing is that Firefox iOS v13 was just released, and Marathi is a new locale this time around. Congratulations to the team. On Firefox for Android front, Bosnian (bs), Occitan (oc) and Triqui (trs) are new locales that shipped with on current release version, v61. And we just added English from Canada (en-CA) and Ligurian (lij) to our Nightly v63 multi-locale build, which is available through the Google Play Store. Congratulations to everyone! Other than that, most mobile projects are on a bit of a hiatus for the rest of the month. However, do expect some new and exciting projects to come in the pipeline over the course of the next few weeks. Stay tuned for more information! About two weeks ago, over 160 sets of curated add-on titles and descriptions were landed in Pontoon. Once localized, they will be included in a Shield Study to be launched on August 13. The study will run for about 2 months. This is probably the largest and longest study the AMO team has conducted. The current Disco Pane (about:addons) lists curated extensions and themes which are manually programmed. TAAR (Telemetry Aware Add-on Recommender) is a new machine-learning extension discovery system that makes personalized recommendations based on information available in Firefox standard Telemetry. Based on TAAR’s potential to enhance content discovery by surfacing more diversified and personalized recommendations, the team wants to integrate TAAR as a product feature of Disco Pane. It’s called “Disco-TAAR”. The localized titles and description will increase users’ likelihood to install and install more than one. To be part of this study, you need to make sure your locale has completed at least 80% of the AMO strings by August 12. Like many of you, the team is taking a summer break. However, when they come back, they promise to introduce a new home page at the beginning of next month. There should be no localization impact. We now have 70 locales showing interest in the project. Many have reached 100% completion or close to it. Congratulations to reaching the first milestones. However, your work shouldn’t stop here. The sentence collection is a major challenge that all the teams face before the fun recording part can begin. Ruben Martin from the Open Innovation team addresses the challenges in this blog post. If you want to learn more about Common Voice project, sign up to Discourse where lots of discussions take place. August fundraising emails will be sent to English audience only, the team realizes a lot of people, especially Europeans are gone on holidays and won’t be reading emails. A lot of localizers should be away as well, so they decided it was best to skip this email and focus on September fundraiser. The Internet Health Report team has started working on next year’s report and is planning to send a localized email in French, German and Spanish to collect examples of projects that improve the health of the internet, links to great new research studies or ideas for topics they should include in the upcoming report. As for the localized campaign work, it is slowing down in August for several reasons, one of them being an ongoing process to hire two new team members to expand the advocacy campaigns in Europe: a campaign manager, and a partnership organizer. If you know potential candidates, that would be great if you could forward them these offers! That being said, you can expect some movement on the Copyright campaign towards the end of the month as the next vote is currently scheduled on September 12th. The most critical piece of information coming from the tags feature is file priority. It used to be pretty hard to discover, because it was only available in the rarely used Tags tab. We fixed that by exposing file priority in the Resources tab of the Localization dashboard. Similarly, we also added a deadline column to the localization dashboard. Pontoon introduced the ability to enable locales for projects in read-only mode. They act the same as regular (read-write) locales, except that users cannot make any edits through Pontoon (by submitting or reviewing translations or suggestions, uploading files or performing batch actions). That allows us to access translations from locales that do not use Pontoon for localization of some of their projects, which brings a handful of benefits. For example, dashboards and the API will now present full project status across all locales, all Mozilla translations will be accessible in the Locales tab (which is not the case for localizations like the Italian Firefox at the moment) and the Translation Memory of locales currently not available in Pontoon will improve. Expect more details about this feature as soon as we start enabling read-only locales. Thanks to a patch by Vishal Sharma, translations status in the History tab is now also shown to unauthenticated users and non-Translators. We’ve also removed rejected suggestions from the string list and the editor. The Jakarta l10n event has taken place last weekend with the local community. Some of the things we worked on include: localizing Rocket browser in Javanese and Sundanese, localizing corresponding SUMO articles, refining style guides… and much more! Many communities have made significant progress in the third step: donating their voices. In July, recording were made in the following languages and more. For the complete list of all the languages, check the language status dashboard. intl_pluralrules determines the CLDR plural category for numeric input by leveraging Unicode Language Plural Rules and plural rules from Unicode CLDR. That category can be used to identify the correct string variant that should be used in localization. The crate is available on crates.io, and can be used as a library in any Rust program. For example, the Rust implementation of the Fluent Project is the first system using intl_pluralrules for handling pluralization. In short, numbers can change the way words appear in a string. In a simple example, the English words “page” and “pages” are different because of pluralization. English plural forms are fairly simple; in other languages, the rules can be more complex. If software is built with one plural paradigm in mind, localizing for several languages (each with its own unique paradigm) becomes a complicated process–and unnecessarily so. Flod’s blog post on the advantages of Fluent describes the problems and potential benefits intl_pluralrules crate addresses in his section, Plural Forms. If you would like to know more about why crates like intl_pluralrules are vital to i18n and l10n in Rust, start with Flod’s post. Unicode’s Language Plural Rules provides a defining set of characteristics that affect the plural category the number belongs to in certain languages. These characteristics are called operands. 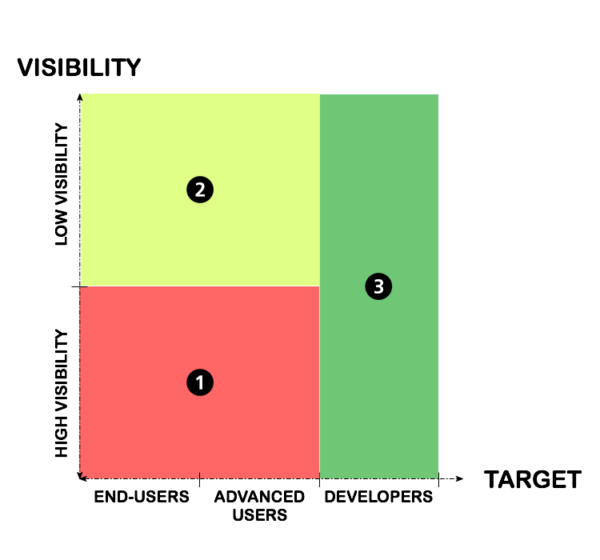 The set comprises an absolute value, integer value, fraction value with and without trailing zeros, and the number of fraction digits with and without trailing zeros. 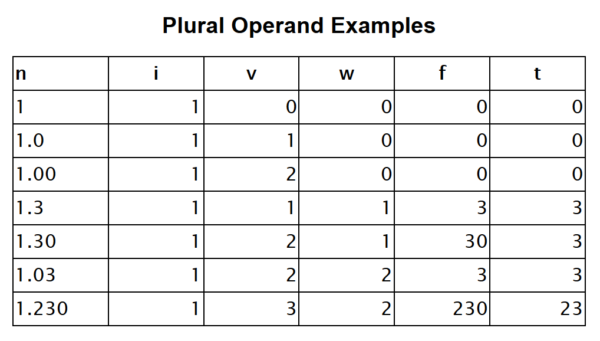 The intl_pluralrules crate creates a set of operands from the input and uses those operands when determining the plural category. Notice the difference between the v value (number of visible fraction digits) for 1 and 1.0. 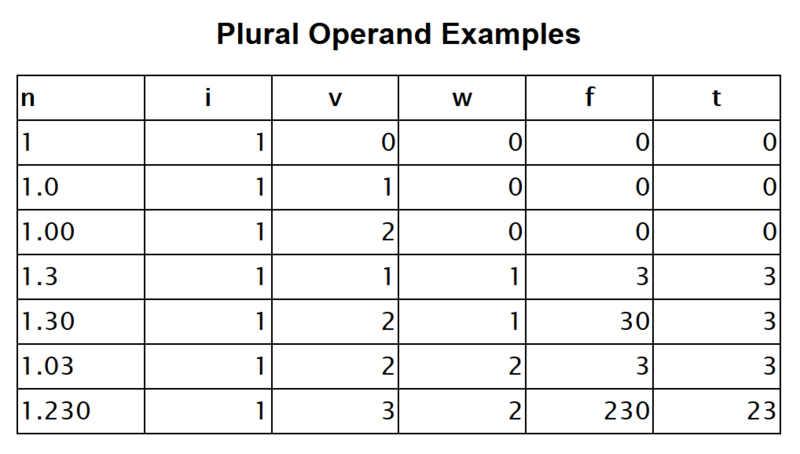 Although 1 and 1.0 represent the same literal value (both represent a singular value), the presence of a decimal can change the plural category in some languages. For example, although in English it is unlikely to see whole count nouns measured in float style (with a trailing zero decimal), the correct plural form for 1.0 is “other”, not “one.” This means that the pages example from the previous section would read, “You have 1.0 open pages” rather than “You have 1.0 open page.” This distinction may seem strange because, as mentioned, this is an unusual use for 1.0 in English. Nonetheless, you will find that it is the proper plural form. Because Rust’s float types do not preserve trailing zeros when stringified, the from method uses Rust’s ToString trait on its input when generating plural operands. This allows a user of the crate to send string or numeric input to the system, and, so long as it is a valid float or integer value, it will be accepted. intl_pluralrules depends on two associated crates that reside in the same GitHub repository and are also available on crates.io: cldr_pluralrules_parser and make_pluralrules. cldr_pluralrules_parser parses the plural rules from the JSON CLDR repository and builds an AST representation of the rules. The following code snippet shows the English and Russian plural rules from CLDR. make_pluralrules generates a Rust file from that AST. The following code snippet shows the generated Rust plural logic for English. The Rust file generated by these crates is used in intl_pluralrules to determine the plural form of a number. Using intl_pluralrules is a two-step process. The user must create an IntlPluralRule instance by providing a BCP 47 language tag* and a plural type (cardinal or ordinal) to the create method. This will use the generated Rust file to create an IntlPluralRule object. A number needs to be passed to the select method on the IntlPluralRule instance created in step 1. The value returned from step 2 is the plural category. First, intl_pluralrules has landed in fluent-rs, meaning that the Rust implementation uses the crate for handling all plural-concerned instances. Because intl_pluralrules leverages the available data from Unicode, Fluent’s selection process for plural-concerned strings in any FTL file is completely automated. So long as the provided CLDR file has rules for your locale, the developer will not need to hard code plural logic into the software and localizers won’t need to report a bug in order for the correct plural string to be activated. Second, intl_pluralrules is fast. The crate is still in prerelease because, although fully functional, some optimization features are still being discussed. In spite of intl_pluralrules’ WIP status regarding optimization, the system is still incredibly performant. Compared to ICU’s C PluralRules, intl_pluralrules is approximately 20 times faster in a simple benchmark test. Intl_pluralrules’ comparative speed is due to the decision to store plural rules as compiled Rust code, rather than as CLDR syntax to be parsed at runtime. Using cldr_pluralrules_parser and make_pluralrules to generate the Rust version of the CLDR rules, the plural rules are compiled into the crate. This makes the crate slightly larger but also quicker because CLDR rules are not parsed at run time (as they are in ICU), which is the main source of the speed disparity. As intl_pluralrules moves towards 1.0, it is expected that performance will only increase. In the bigger picture, the release of intl_pluralrules means that the Rust ecosystem gains a higher-level internationalization and localization API, hopefully the first of several. Conversely, the internationalization and localization ecosystem gains use of this API, which leverages the performance benefits of the Rust Language. We have new contributors helping to revive Afrikaans l10n. Welcome Jean, Stephan and Vincent! Firefox 61 has been released on June 26th. This also means that Firefox 62 is in Beta, while 63 is on Nightly, and that’s where you should focus your work for localization and testing. This development cycle will be a little longer than usual, to account for Summer holidays in the Northern hemisphere: the deadline to provide your localization for Beta is August 21st, with Firefox 62 planned for release on September 5th.That’s a Wednesday and not a Tuesday, which is the common release day for Mozilla products, because September 3rd is a public holiday in US (Labor Day). We talked about Shield Studies in the l10n report for May. about:studies is now available for localization. Issues can occur when multiple instances of Firefox are open, and a pending update is applied to one of them. A new page, about:restartrequired, was created to inform the user that a restart is needed to avoid such problems. Activity Stream is expanding beyond the New page. One of the directions is to experiment with a new, in-product first run experience, about:welcome, replacing the existing one based on web content served from mozilla.org. One important note about Activity Stream (about:newtab and about:welcome): unlike other strings in Firefox, once translated they are not used directly in the following Nightly, they need a new build of Activity Stream (for now). That normally happens once a week. For this reason, if you’re targeting Beta, make sure to prioritize localization of activity-stream/newtab.properties. Two new Test Pilot experiments were published on the website about 3 weeks ago: Color and Side View. While the experiments themselves were not localized, new content was added to the website. Unfortunately, that happened with poor timing, resulting in English content being displayed on the website. The following cycle is longer than usual (normally they are 2 weeks long), because most people were traveling for the bi-annual Mozilla All Hands, making things worse. We realize that this is less than ideal, and we are trying to set up a system to avoid repeating these mistakes in the future. As mentioned in the section about Firefox desktop, Firefox 61 has been released on June 26th, which means that Firefox for Android 61 updates will start rolling out to users progressively. Please refer to the section about Firefox desktop above since the Firefox for Android release cycle is the same, and the comments concerning localization apply as well. We’ve also recently decided to stop updating the What’s New content for Firefox Android (due to low visibility and interest in localizing this section, and the fact that it does not affect the number of downloads – amongst other things). This means the locales that were supported by the Play Store will no longer need to localize the updated version for Beta each time we are releasing a new version. Instead, we’ve opted for displaying a generic message. On the Firefox iOS front, English from Canada (en-CA) was added to the ever-growing list of shipping locales with the new v12. Congratulations on that! Next update (and so, new strings) is slowly creeping up, so stay tuned for more. Focus Android locales are also continuously growing, with Afrikaans (af), Pai-pai (pai), Punjabi (pa-IN), Quechua Chanka (quy) and Aymara (ay) teams having started to localize. Note that there are public Nightlies available on the Play Store that you can test your work on. Instructions on how to do that are here. And finally, after months of silence localization-wise, Focus iOS will get new strings soon! However at the moment, we are not opening the project back up to new locales as there is no clearly defined schedule, and we cannot guarantee by when new locales can be added once completed. An FAQ page on privacy and data collection practice at Mozilla will be made available for localization for all languages. This will come soon. There are twelve locales that are identified as priority locales based on Firefox desktop user size: de, es-ES, fr, it, id, ja, nl, pl, pt-BR, ru, tr, zh-CN. This means Privacy Notice for key legal documents will be supported and updated in these languages at an ongoing basis. The rest of the previously supported locales will remain available, but will be redirected to English for the latest updated versions. The Privacy landing page is going through a makeover. The right side panel will be revised by archiving documentations for EOL products. In the near future, we will roll out a new Homepage, and a brand new User Profile section (with stats and leaderboard), so we will need lots of help localizing this! Copyright campaign! The battle to fix copyright has started a few days ago, and while we were disappointed by the JURI Committee vote, we’re now mobilizing citizens to ask a larger group of MEPs to reject Article 13 during the EU Parliament plenary on July 5th. We can still win! In the second half of 2018, the Advocacy team will have a bigger focus on both Europe and company misbehavior around data, so we can expect more campaigns being localized. It’s also an opportunity to mobilize internal resources to plan and build localization support on the new foundation website. On fundraising, the current plan for the coming month is to communicate an update to existing donors, do various testing around it, then send a broader fundraising ask towards end of July/beginning of August. The donate website will soon get a makeover that will fix some layout issues with currencies, and generally provide more space for localization. Which is good news! Several foundation website will also soon get a unified navigation header to match the one on foundation.mozilla.org. Reviewing pending suggestions regularly is important and making them discoverable is the first step to get there. That’s why we got rid of the misleading Suggested count, which didn’t include suggestions to Translated strings, and started exposing Unreviewed suggestions in a new sortable column in dashboards. It’s represented by a lightbulb, which is painted blue if unreviewed suggestions are present. To help you prioritize your work, we rolled out Tags. The idea is pretty simple: we define a set of tags with set priority, which are then assigned to translation resources (files). Effectively, that assigns priority to each string. Currently, tags are only enabled for Firefox, which you’ll notice by the Tags tab available in the Firefox localization dashboard and filters. Pontoon Tools is a must-have add-on for all Pontoon users, which allows you to stay up-to-date with localization activity even when you don’t use Pontoon. Michal Stanke just released a new version, which is now also available for Chrome and Chromium-based browsers. Additionally, it also brings support for the aforementioned Unreviewed state and enables system notifications by default. Extensions for Firefox are built using the WebExtensions API, a cross-browser system for developing extensions. The WebExtensions API has a rather handy module available for internationalizing extensions – i18n. It stores translations in messages.json files, which are now supported in Pontoon. For more technical details on internationalizing WebExtensions, see this MDN page. As mentioned in the last month’s report, Pramit Singhi is working on Pontoon homepage redesign as part of the Google Summer of Code project. Based on the impressive amount of feedback collected during the research among Pontoon users, he came up with a proposal of the new homepage and would like to hear your thoughts. Please consider the proposal a wireframe, so he’s more interested in hearing what you think about the overall page structure and content and less so how you like fonts and colors. The French l10n team will be gathering in Paris at the end of July, to discuss many topics including improvements to the current localization and participation process to make it even more easy for newcomers, improvements to the team communication and do some training for the most recent team members. This event is part of our 2018 l10n community events, so don’t forget to start planning yours and make your request! Indonesia (Jakarta): L10N-drivers are currently organizing a sprint with the local community, in order to add Javanese and Sundanese to Firefox Rocket shipping locales – and thus hopefully help expand our user base in Indonesia. Do you know anyone who would like to help localize in these two languages? Get in touch! Francis who speaks many languages, joined the l10n community not long ago, thanks to the Common Voice project. He has been actively involved in bringing new contributors and introduce new localization communities to Mozilla. He also makes sure the new contributors have a simple onboarding process so they can contribute right away and see the fruit of their work quickly. Additionally, Francis files issues and fixes bugs through the project on GitHub. Thank you! Know someone in your l10n community who’s been doing a great job and should appear here? Contact one of the l10n-drivers and we’ll make sure they get a shout-out (see list at the bottom)! Last year we introduced a new review process in Pontoon with the ability to explicitly reject suggestions. That allowed us to accurately filter out suggestions in need of a review from approved and rejected ones. For more details, check out this blog post. Today, we’re shipping the final piece of the puzzle to make unreviewed suggestions truly discoverable: we’re exposing them on dashboards. We’re also getting rid of the misleading Suggested count, which didn’t include suggestions to Translated strings. Suggested strings will be treated as Missing from now on – as they are in the product. To make unreviewed suggestions stand out even more, we’re also introducing a new sortable column in dashboards. It’s represented by a lightbulb, which will be painted blue if unreviewed suggestions are present. A huge shout-out to Adrian Gaudebert, who contributed this important feature. Reviewing pending suggestions regularly is important and making them discoverable is the first step to get there. 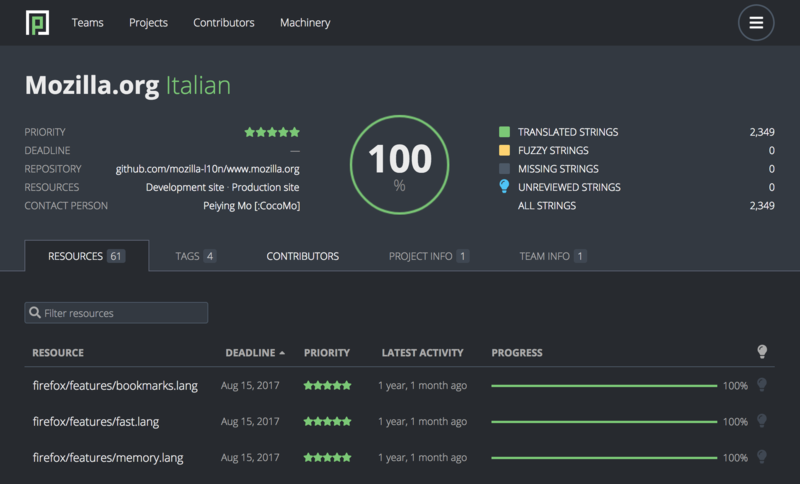 While at Mozilla we want to ensure consistent and high-quality translations, we also want to make sure that contributing is a rewarding and pleasant experience for everyone. Translating in a timely manner is important, however there are other essential things to take into consideration. For example, leaving non-urgent projects with missing strings so that new localizers can get involved is one of them. Reviewing pending suggestions regularly is another – and the main topic of this post. In the last few months, the l10n-drivers Project Management group (Delphine, Peiying, Flod, Jeff, and Théo) has taken a good look at the state of pending suggestions across teams and projects in Pontoon, and has decided to take more direct action in order to ensure that localizers (newcomers and old timers alike) get timely and constructive reviews. In fact, a lack of timely replies – or worst, a total lack of replies – creates an unwelcoming environment and risks losing contributors. We started reaching out to some teams individually – but given the amount of locales concerned, it seems a broader “call to action” at this moment is a better way to kick things out. As a first step, we’d like communities that have more than 300 pending suggestions to go through these and take some time to bring that number down. In fact, our goal this year is not only to get a better picture of the health of the localization communities, but also to take action in order to ensure our localization communities are thriving and healthy. This is just one of many steps to get there. The reality is that when a locale has hundreds or thousands of unreviewed suggestions, and that remain unreviewed for months, it creates an unwelcoming environment for newcomers who could have a high impact on the project with some mentorship. Seeing these high numbers will make new potential localizers think that no one is paying attention, that they will not be able to get involved effectively and that they won’t be able to make an impact. In addition to being unwelcoming, this slowly creates a closed localization community, as the lack of reviews and transparency restrict involvement to only a handful of localizers (or in some cases, one localizer alone). In the case of teams that have thousands of unreviewed strings, one way that they can start thinking about this is if there are any projects that have become less important, that they are less passionate about, and that they do not want to work on anymore. In this case, they can simply reach out to the Project Manager in charge in order to discuss the situation. The Project Manager can also easily be found on the Pontoon UI under each project page, next to the “Contact Person” field. If still in doubt, simply reach out to the dev-l10n mailing list and we will gladly respond from there. So, what are our next steps here? Starting in July, we will reach out to teams that still have more than 300 pending suggestions and ask that they bring that number down. In lack of response, or if no action on pending suggestions is taken, we will carefully evaluate which contributors to give more permissions to and assign translator rights to new particularly active localizers. We will also talk with them on how to coordinate the localization activity for the locale. So this is a call to action for every locale that has pending suggestions: please help us ensure that we all have a great experience in localization at Mozilla, by not only welcoming and onboarding newcomers in your team – but also making sure everyone gets a timely review of their work. Pontoon documentation explains what a healthy localization workflow can look like, and we invite you to take a look at it here. Almost a couple of years ago I started working on a concept called string tiers. 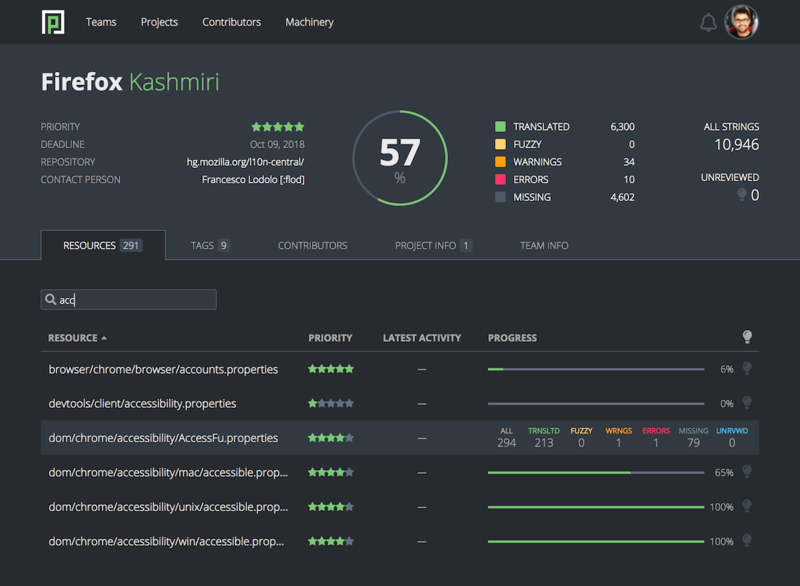 The goal was twofold: on one side help locales, especially those starting from scratch, to prioritize their work on a project as large as Firefox, with currently over 11 thousand strings. On the other hand, give project managers a better understanding of the current status of localization. Given the growth in complexity and update frequency of Developer Tools within Firefox (currently almost 2,600 strings), finding a solution to this problem became more urgent. For example, is a locale in bad shape because it misses thousands of strings? The answer would not automatically be ”yes”, since the missing strings might have a low priority. The string tiers concept assigns priority to strings based on their target – who is meant to see them – and their visibility. The idea is quite simple: a string warning the user about an error, or requiring an action from them, is more important than one targeting developers or website owners, and buried in the Error Console of the browser. If you’re interested in knowing more about string tiers, the full document is available here. 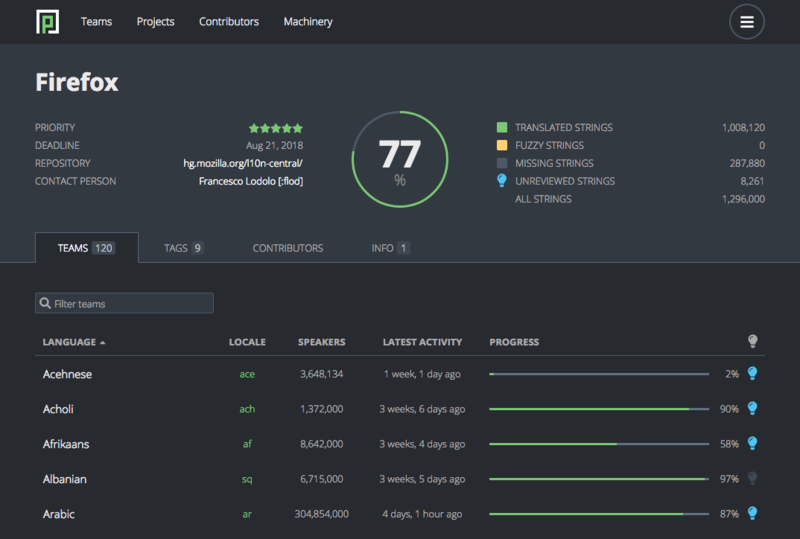 In the past few months the Pontoon team – Ryan and Matjaz in particular – has been working hard to implement the back-end for supporting string tiers. Since the system can be used for more than just priority, we decided to use a more generic term: tags. Translation resources – files in the case of Firefox, not individual strings – can be associated to one or more tags. At a glance you have access to all the information you need: the priority associated to a tag, its translation status and latest activity. 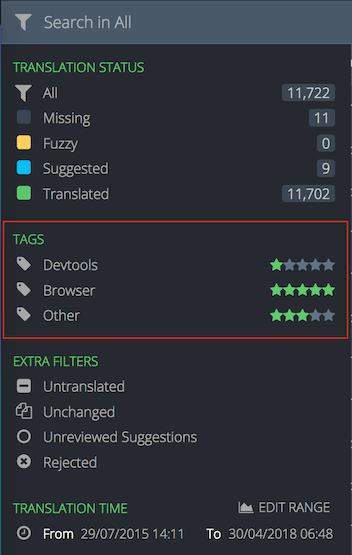 You can use the progress bar to access the strings, for example to translate missing strings or review suggestions, but note that tags are also available in filters. Pontoon’s documentation is already up to date with information about tags. 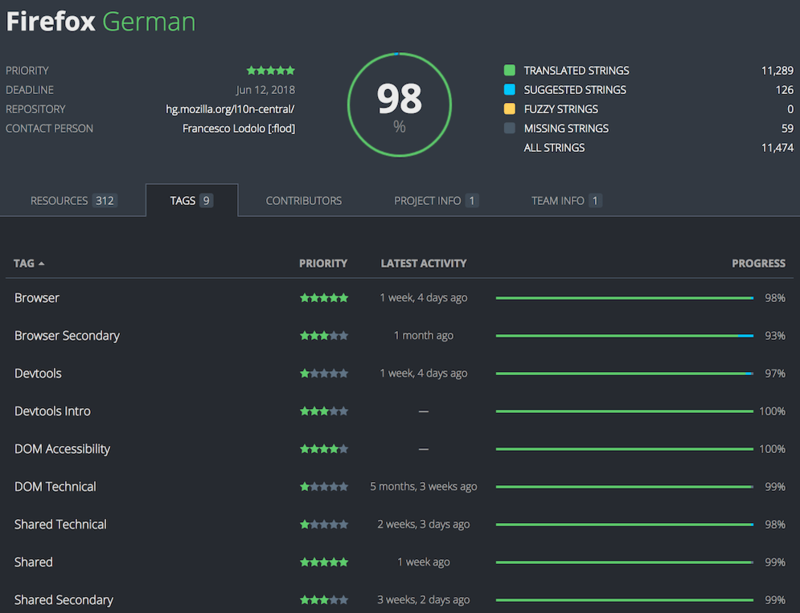 Project managers can now see the overall translation status of each tag, but also a breakdown with the status of each locale for a specific tag. This is a brand new feature, and required a lot of code changes in Pontoon. If you find bugs, or want to add features, feel free to file a bug. Kumar Ritu Raj just finished localizing and testing Focus Android v5 in Angika language (which is going to launch soon!) and he is doing BCA from TP College, BNMU, Bihar, India. Welcome and congratulations! Common Voice: Jimi of Danish and Dimitris of Greek, thank you for taking the lead in your respective language. We recently added several locales to Pontoon: Arpitan (frp), Canadian English (en-CA), Cornish (kw), Iloko (ilo). If you speak any of these languages and want to help, take a look at Pontoon or get in touch. Activity Stream has become an integral part of Firefox, officially replacing the existing New Tab and soon integrating code for displaying snippets and onboarding content. For this reason, we’re working on moving translations to mozilla-central. 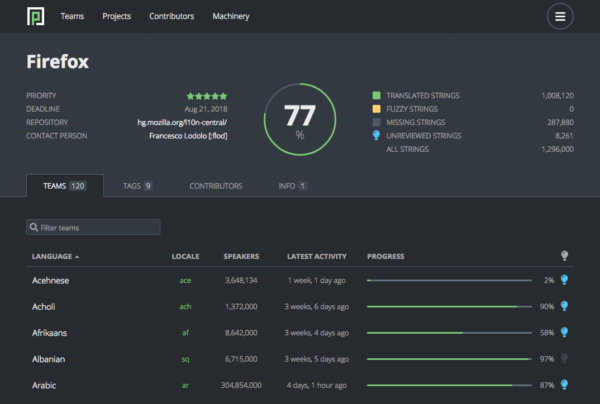 Currently, Activity Stream is managed as a stand-alone project in Pontoon, and store its translations in a GitHub repository. Once this meta bug is fixed, Activity Stream’s strings will be exposed as part of the Firefox project. While this makes the relation between Activity Stream and Firefox more obvious for localizers, it will also allow to make some improvements in the future, like reducing the lag between translations landing in repositories and actually being available for testing in Firefox. There are some changes in the release schedule for the Summer, with the Nightly cycle for 63 lasting 10 weeks instead of 8, and the effects of this change rippling to the end of year. Does this impact you as a localizer? Luckily, not really, thanks to cross-channel. 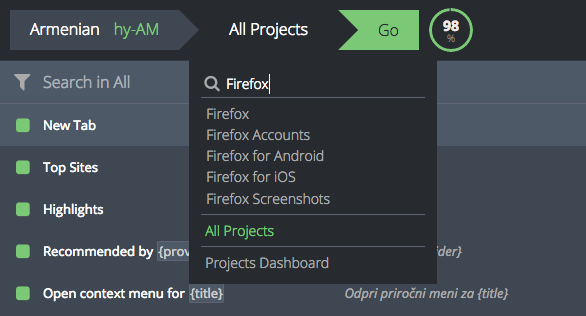 Just don’t forget to keep an eye on the deadlines in Pontoon for the Firefox project, and you’ll be all set. If you’re curious, you can always check the official Release Calendar. Shield studies are A/B tests, deployed to a specific portion of Firefox users, designed to test features or changes and analyze their impact. So far, these studies have been targeting only English users (with one exception), and didn’t require localization. This week we started localizing our first study: it’s an extension that will be enabled initially only for Nightly, and for a limited number of locales (4) that have a significant population on the Nightly channel. We will also expose the opt-out preference for Shield studies, together with the about:studies page, to all languages in Firefox in the coming days. If you’re interested in Shield studies, you can find more details in this wiki page. There’s been quite a few things going on in mobile world recently, as you’ve probably noticed. We’ve recently exposed strings for the upcoming release of Firefox iOS v12, that aims to launch around June 12th. The tentative deadline for localizing and testing is May 23rd. Screenshots are updated twice a week. Firefox for Amazon Fire TV is shipping an update very soon, probably some time next week. We’ll be getting updated screenshots for testing very soon, stay tuned! Same for Focus Android v5 that is coming up, and will feature three new locales: Angika (anp), Cornish (kw) and Purépecha (tsz). Congrats to the localizers involved in this effort! Firefox for Android is updating to v60 as we speak, and is being progressively rolled out to users. Common Voice was launched on May 2nd in 29 languages. Thanks to many communities’ active participation to get to the finish line, especially with quite a bit of last minute changes. More languages will be added as they reach the completion criteria. The team has been continually impressed with the thoroughness of communities around the globe down to the wire, to test, to identify issues, and they have not stopped just because the product or their language is launched. The bugs keep coming, not just for translation but for site stability and UX issues. Here is one example. Currently, only the website is localizable. The next step is to start recording voices in new languages. To that end, we need sentences for people to read in these new languages. The Common Voice team is participating the Mozilla’s Global Sprint to help collect and review new sentences for people to read. Only after that, the team will start collecting voice data in a new language. On the advocacy and fundraising side, we’ve had an opportunity to respond to the Clear History feature announced by Facebook during the F8 conference, but the team is mostly focusing on the long term strategy on how to move the conversation to the broader data and privacy topic. We’re happy to announce that Vishal Sharma and Pramit Singhi will be joining us for the Google Summer of Code project this year! They will help us improve the path to first contribution, including the homepage redesign and guiding new users to submitting their first translation. That should help us grow l10n communities. Pontoon now runs compare-locales checks when you submit a translation – the same library that is used during the Firefox build process. That allows Pontoon to prevent you from submitting translations that can break Firefox. Read more about the updates we made to the way quality checks work. 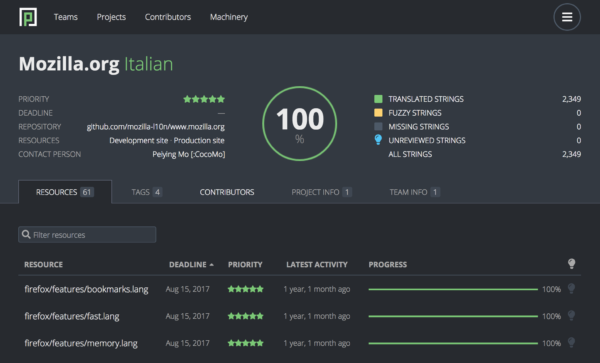 Pontoon now allows you to translate strings across all projects in a single translation interface, which helps you work on all untranslated strings in one go, or review all pending suggestions submitted by your team contributors. We also changed the way search works by bringing it closer to the default behaviour of search engines. We realized that several communications we send to the dev.l10n.web mailing list concern only a small subset of locales, and are meant to be ignored by the vast majority of people. In order to keep the signal-to-noise ratio low, we are changing the way we communicate project updates like snippets and newsletters. From now on, we will try to rely as much as possible on Pontoon built-in notification system, allowing us to send notifications only to existing contributors in the target locales. This way, communications in dev.l10n.web should be more relevant for everyone. 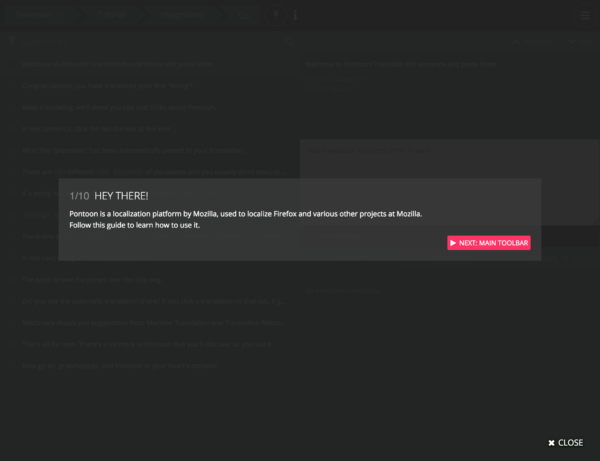 This also means people contributing to Engagement projects won’t get notification directly in their inbox, but using the Pontoon Tools add-on from Michal Stanke will get you almost real-time notifications in your browser. If you’re usually contributing to those projects, please keep an eye on Pontoon notifications if you don’t want to miss schedule, deadline or context about new content. If you’re planning to meet your fellow teammates this year, or planning an event with other locales, make sure to check our plans for l10n meetups in 2018 and the process to organize meetups. We can’t wait to see the meetup ideas you may have! In Q1, 78 localized snippets generated 2,131,516,000 impressions (for real!!). Of the 78 snippets, 26 snippets had links that generated 125,000 clicks (whoa!!). Felix, also known as Djfe, leads the way in filing the number of issues for Common Voice project. Reported problems include translations, functionality testing and UI designs. Thank you for your active participation as a localizer and as a Mozillian! When submitting a translation, Pontoon runs automated quality checks. They identify issues with punctuation, capitalization, variables, etc. before translations are saved, which prevents localizers from submitting bad translations. We just launched several improvements to the way quality checks work, so let’s have a look. 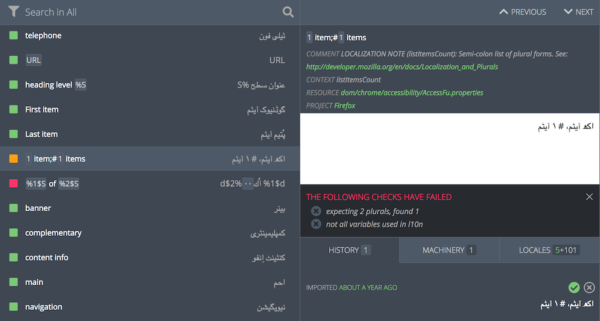 In addition to internal Pontoon checks and Translate Toolkit checks, Pontoon now also runs compare-locales checks. They are used when building Firefox, so it’s much harder now for localizers to break Firefox builds by submitting a bad translation through Pontoon. There are two types of quality check failures now: errors and warnings. 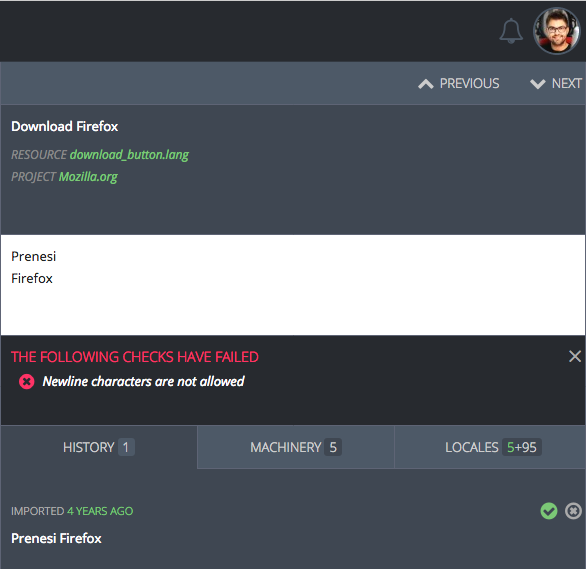 Errors cover issues that would cause the translation to be unused in product, for example removed from Firefox builds or mozilla.org. For this reason, errors cannot be bypassed by localizers – the button to submit a translation is removed and the error needs to be fixed before the translation can be saved. Errors are denoted with a red circled X. Warnings, unlike errors, are displayed when we’re not completely sure that the string contains critical issues (false positives). For that reason, warnings can be bypassed by localizers – they can save a translation anyway. Note: since Translate Toolkit checks may result in many false positives in some scenarios, they can be turned off using the Translate Toolkit Checks toggle (previously called Quality Checks). Thumbs up to Jotes for turning this long awaited feature into a reality! He’s already busy with the next step, which is storing information about the failed checks in a database. Once that’s in place, we’ll start performing quality checks during sync and finally present the information about errors and warnings on dashboards.